Tom Robichaud is following the restoration of the Paul Richardson number 427. The car was owned by Jimmy Timmons and was driven by Paul Richardson and the legendary Howie Brown, among others. This car is in the process of restoration by Rick's Rod Shop in Epping, New Hampshire. For more information on the restoration or if you have any information they might use, you can email Rick's directly at ricksrodshop@mediaone.net. "Jim Timmons of North Andover Ma. built the car in 1968 and it was originally for Billy O'Brian. Paul Richardson drove the car for the longest time, then Tom Sherwood, Bob Milette, Jim Martel, Ed Schofield, the great Howie Brown, Tom Quinny, Babe Branscomb and Butch Walsh drove for us in Fla. when Ed West drove him into the wall in the third turn at Vero Beach. 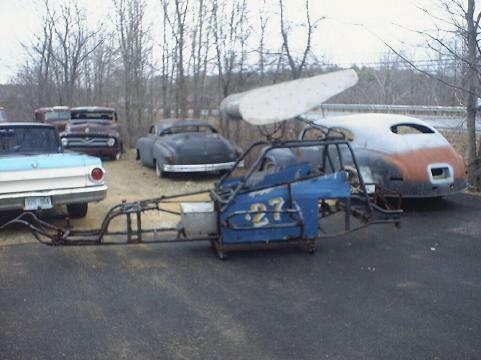 Note from Rick at Rick's Rod Shop... "I'm the owner of the #427 car and am looking for lots of parts to restore it. Need open tube offset rear end front axle. CAE in out box. Schroder steering box. Wide 5 hubs. If you know of anything please let me know. Thanks." If you think you might be able to help, please email Rick at ricksrodshop@mediaone.net. "I've found all kinds of parts for both of my cars. Just by chance I called Bob Turner in Maine and he had all the parts for the 427 rearend. He's had them for almost 30 years in the corner of his shop. Bet that couldn't happen again in 100 years. I got lucky. He also has a front axel almost complete. I'll keep you posted on the progress. Keep in touch thanks." This is how the car looked in 1967 when Paul Richardson was driving at the Star Speedway. 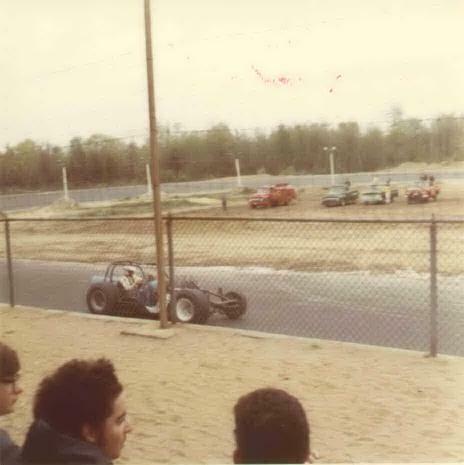 A recent picture of the supermodified sitting up at Rick's Rod Shop in Epping, New Hampshire.